In her first report as Environment Commissioner of Canada, through the Auditor General of Canada offices, Julie Gelfand brings focus to the failure of Canada with respect to climate change initiatives, green house gas regulation, and all targets set for reduction of emissions. "Environment Canada lacks...an effective planning process for how the federal government will contribute to achieving the Copenhagen target." "Two years later (after the 2012 audit), the evidence is stronger that the growth in emissions will not be reversed in time and that the target will be missed." what Environment Canada’s role will be in future oil sands environmental monitoring." a regular report to Parliament so that Canadians understand what has been achieved and what remains to be done." "Given its commitment to be a world-class regulator, Environment Canada should publish its plans for future regulations to reduce greenhouse gas emissions, such as the oil and gas regulations, with sufficient detail and lead time, so that consultations with interested and affected parties can be transparent and broadly based, and the parties can plan effectively." With respect to the oil and gas sector the report indicates: "According to Environment Canada, the oil and gas sector will contribute 200 megatonnes to national emissions in 2020. This is 27 megatonnes more than in 2012—a larger increase than any other sector. Despite this prediction, regulations for the sector have been repeatedly delayed." Sierra Club executive director John Bennett commented on the report: "Canada is treading water on climate change, Tar Sands pollution and arctic shipping. We need legislation, regulation and enforcement." Clean Energy Canada posted a blog upon release of the report and indicated: "The overall conclusion of the report can only be seen as a failing grade. Auditors know what it means to make a plan and put systems in place to meet it. The federal government still isn’t taking those basic steps when it comes to tackling climate disruption." Dale Marshall, of Environmental Defence Canada, stated concerns about audit results with regards to oil sands development: "It is disconcerting that on every level, there seems to be little regard for the risks and only an urgency to undertake risky projects," he said. "The monitoring program needs to be strengthened ... we need to look closely at the impact (of oil sands expansion) on human health, which the program doesn’t." The six part Environment Commissioner report is the result of audits of federal government departments with respect to sustainable development and environmental requirements and targets. Each part of the report contains information about how the audit was conducted. Media coverage indicates that Canada’s government agrees with and will act on the concerns of the Environment Commissioner regarding Arctic waters. "Canada will not achieve its 2020 GHG emission reductions target unless significant new, additional measures are taken. More will have to be done. No other conclusion is possible," states a recent report by the National Round Table on the Environment and the Economy (NRTEE). 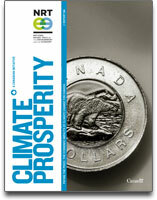 The report, Reality Check: The State of Climate Progress in Canada, was requested by Environment Minister Peter Kent in 2011. At the time Minister Kent stated NTREE was "uniquely positioned" to assess federal, provincial and territorial governments' efforts to reduce GHGs. Ottawa's overall goal is to reduce emissions by 17 per cent from 2005 levels. The report also shows that provinces are more effective than the federal government in reducing emissions. Collectively the provinces are responsible for 75 per cent of GHG reductions so far. This will be the second last report from the NTREE, which for the past 25 years has provided original research and advice on everything from the effect of climate change on the economy to boreal forest ecological services, but whose funding was cut in the 2012 Canada Budget. NTREE is composed of respected scientists, business people and policy experts, all appointed by the federal government. Its mandate is to offer policy advice to the government of the day on ways to grow the economy in an environmentally sustainable way. Former Conservative MP and member of NTREE Bob Mills described the decision to cut NTREE funding as "dumb." "If you're smart you surround yourself with really smart people. And if you're dumb, you surround yourself with a bunch of cheerleaders. We don't need cheerleaders. What we need are smart people," Mills said. "The national round table was able to say, 'Listen, look 20 years out. Look 30 years out. Your natural capital is your environment. Unless you preserve it, then you don't have an economy in the end," said former Nova Scotia Progressive Conservative environment minister Mark Parent. "Mulroney appointed scientists galore. We had one of the best climate change scientific establishments in the world. We were leading the way in many areas. He didn't fire scientists when they said things he didn't like," said Jim MacNeill, a former director of the Organization for Economic Co-operation and Development and an NRTEE member. "I think that perhaps the Prime Minister has forgotten that the name of the round table is not the National Round Table on the Environment or the Economy. It's the National Round Table on the Environment and the Economy," added insurance industry executive Angus Ross. Scott Vaughan, Canada Commissioner of the Environment and Sustainable Development, released a report highly critical of the Canadian Government May 8, 2012. The government did not comply with the Kyoto Protocol Implementation Act. The Conservatives have announced they will repeal the Kyoto Implementation Act arguing that it is too costly for Canada to remain part of the Kyoto Protocol. The Commissioner found that Conservatives had no cost estimates to back this claim. 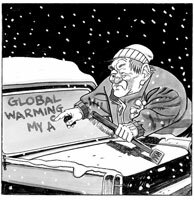 According to Environment Canada's own forecasts Canada will not meet current targets of 17 per cent below 2005 levels by 2020. Instead emissions are set to increase 7 percent above the 2005 levels. Ottawa is facing a $7.7 billion bill to clean up 13,000 federally-owned contaminated sites across the country, but has only set aside a fraction of the money needed. "I have grave concerns. 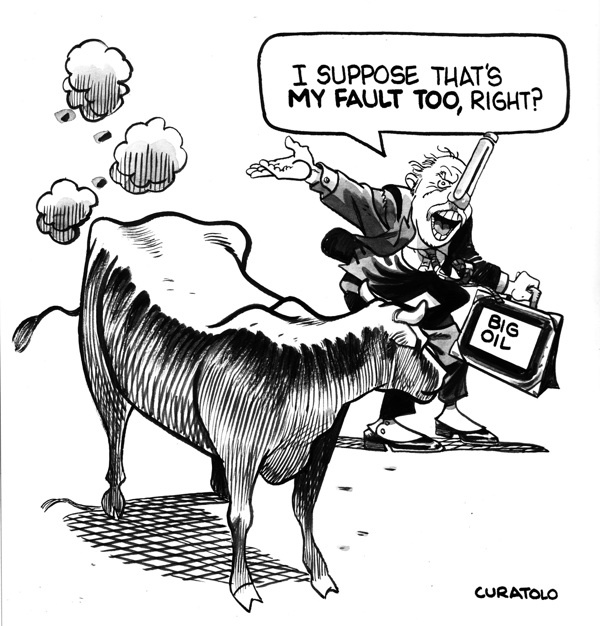 Climate change is about a moral responsibility, intergenerational responsibility, and under the Kyoto Protocol Implementation Act, they also had legal responsibility. Under the Budget Implementation Bill, they're going to repeal that," said Liberal Environment Critic Kirsty Duncan. "Without an implementation plan, industry, consumers and other levels of government lack a solid basis for knowing how to adjust technology and make formal investment decisions," said Vaughan. NDP Environment Critic Meagan Leslie said "It's pretty unbelievable for the Conservatives to say they will ditch one plan, say, 'We're going to do it sector by sector, we have a plan, the plan is working.' It's very clear the plan is not working." "We cannot ignore environmental liabilities, whether due to the climate crisis or toxic waste sites. Economic health is completely dependent on ecological health," said Green Party Leader Elizabeth May. Canada's National Roundtable on the Environment and the Economy (NRTEE) has published a report indicating the potential cost of climate change to Canada. According to the report; Paying the Price: the Economic Impacts of Climate Change for Canada, if greenhouse gases are not reduced and if Canada does not invest to adapt to climate change, the cost to Canada will be in the billions. 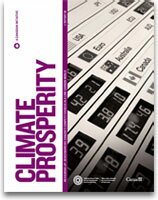 The report is the first national analysis of the impact climate change could have on Canada's economy. The report goes on to say that the impact of climate change on Canada's economy could cost from $5Billion by 2020 to $43 Billion by 2050. The NRTEE analysis indicates that if climate change accelerates in combination with population and economic growth in Canada the costs could rise as much as $91 Billion by 2050. "This report sets out to help all of us - governments, business, and communities - to make climate-wise investment choices now, and in the future. The economic information we provide here will further help us understand what is at stake if we fail to respond and GHG emissions continue to rise," said NRTEE Vice-Chair Robert Slater. Maxim Coal Plant Loop Hole To Be Closed? Canada's Environment Minister Peter Kent has set up public review of coal regulations, to take effect in 2015. At the same time Maxim Coal in Alberta is proposing a new coal plant that would pump out three million tonnes of pollution per year. Maxim's is the only new coal power plant being proposed in Canada. Over forty diverse civil society organizations from across Canada signed a letter during summer 2011 calling on federal Environment Minister Peter Kent to protect the integrity of Canada's forthcoming coal regulations. They asked the minister to ensure that no proposal evades Ottawa's coal rules. "Coal is the worst offender among fossil fuels when it comes to producing the pollution that cause global warming," says Steven Guilbeault of Équiterre. "Studies have shown that Alberta can meet its future electricity needs without building new coal plants." Recently Minister Kent has said he never intended to create a loophole that would prompt companies to build rule-breaking plants quickly. "I'm sending a strong message that Canadians don't want that to happen, and these regs weren't designed to allow it to happen," Minister Kent said in a media interview. Having walked away from the Kyoto Protocol, Canada's government will not achieve its Copenhagen commitment either, unless more serious action begins, according to new reports by Environment Canada and the National Roundtable on the Environment and Economy (NTREE). According to a July 2011 Environment Canada report, entitled Canada's Emission Trends current Government actions are only expected to reduce greenhouse-gas (GHG) emissions by about one-quarter of the reductions needed to meet the 2020 Copenhagen target. 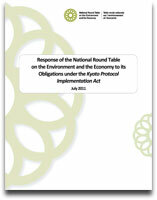 Another July 2011 report, from the National Roundtable on the Environment and Economy (NTREE), entitled Response of the National Round Table on the Environment and the Economy to its Obligations under the Kyoto Protocol Implementation Act, analyzes obligations to reduce Canada's carbon pollution, under the 2007 Kyoto Protocol Implementation Act. The report finds Canada's emissions reduction policies are about half as effective as projected. Still the Canadian Government continues to allow new coal-fired electricity, such as the Maxim Power plant in Alberta, while subsidizing the fossil fuel industry, and delaying meaningful action to reduce emissions. More than 40 civil society organizations across Canada signed a letter calling on Environment Minister Peter Kent to avoid any coal plant being exempt from upcoming regulations, and to avoid licensing new conventional coal plants in Canada. "Stephen Harper can't allow new coal-fired electricity plants to be built, ...and achieve his promise to reduce Canadian greenhouse-gas emissions 17 per cent by 2020. As a researcher of energy-economy systems, I say this with virtual certainty," said Mark Jaccard of Simon Fraser University. The Canadian government admitted that it deliberately left out data indicating greenhouse gases from the tar sands in the 2009 National Inventory Report (NIR) required under the United Nation Framework Convention on Climate (UNFCC) and submitted to the United Nations May 2011. The exclusion of the information has prompted frustration among both environmental groups and even oilsand industry representatives. 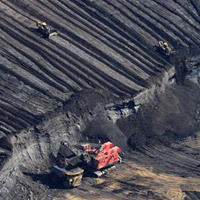 Environment Canada told reporters it was just fulfilling UNFCC reporting requirements, but the lack of mention appears to suggests that the Canadian government is anxious to obscure the source of its fastest-growing source of climate pollution: the Alberta tar sands. Emissions from the tar sands were incorporated in the overall tally in the report. But in the 2008 NIR Environment Canada published sector estimates, which presented emissions in terms that are more familiar to Canadians, using categories like oilsands (mining, in situ, upgrading), cars, buses, cement, forestry, service industries, etc. "It is not as if they were left out of the total, but no matter where you looked in the report you couldn't find out what sector the emissions were from," said Clare Demerse, director of climate change at the Pembina Institute. Despite the economic receission, tar sands emissions continue to climb. Oilsand production accounted for 6.5% of Canadaès overall emission in 2009. Environment Canada first stated that oilsands emissions increased 21% in 2009, with emissions per barrel of oil increasing by 14.5%, over the same period; but it later revised these estimates to an 11% emissions increase, with "very little change in the total emissions intensity" per barrel of oil produced in 2009. Overall oilsands production is set to triple by 2020, according to some projections. Canada was the only nation to submit late emissions data as required by international law under the United Nations Framework Convention on Climate. Environment Canada claims the report was final, but was not been submitted because of the 2011 Canadian General Election. "If the Japanese can pull it together in the midst of a devastating natural disaster, then I don't know what excuse the government of Canada could have for failing to produce it on time," said Graham Saul, Executive Director of Climate Action Network Canada. The data, which is required annually, but reports 2009 emissions, allows government officials and scientists to measure progress in reducing pollution, and whether individual countries are meeting their Kyoto Protocol targets. 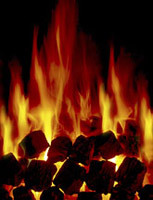 The Canadian data was finally released May 18, 2011, and shows that Canada had reduced its overall emissions by 6%, resulting from plant closures due to the economic recession, and a lessened reliance on coal. Canadian emissions, however, have grown faster than in any other G8 country that signed Kyoto, and remain 23% above our 2012 Kyoto commitment (of 6% below 1990 levels). Canadian emissions grew 24.1% between 1990 and 2008. In contrast, U.S. emissions grew just 13.3 per cent during the same period, and those of the European Union fell 11.3%. Emissions solely from Canada's oilsands grew by 40% between 2005 and 2009. It makes economic and environmental sense for Canada to set its own climate policies now rather than waiting for the U.S. to introduce its system to control greenhouse gas emissions, says a new report, Parallel Paths: Canada-U.S. 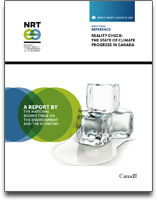 Climate Choices, by Canada's National Round Table on the Environment and the Economy (NRTEE). "Canada clearly needs stronger climate policies, fast – and today's analysis shows that cutting greenhouse gas pollution in Canada is both affordable and feasible. The Round Table's detailed and credible analysis shows that Canada would see strong economic growth across the country even if we lead the United States in adopting a broad-based price on greenhouse gas pollution," said Clare Demerse, Associate Director of the Pembina Institute's climate change program. "Harmonization, where possible and when feasible, make sense for Canada. But in the face of persistent U.S. uncertainty as to its own climate policy future, Canada will need to look to its own options, in the right way, at the right time." said David McLaughlin, NRTEE President and CEO. A price collar that limits the Canadian carbon price to no more than $30.00/tonne CO2e higher than the U.S. price. A Canadian cap-and-trade system with auctioning of permits and revenue recycling to cap emissions and address regional and sectoral concerns. Limited international permits and domestic offsets to keep domestic carbon prices lower for Canadian firms. A technology fund to stimulate investment in needed emission reductions technologies. Canadian Environment Minister Peter Kent said the government is not interested in setting up a Canadian cap-and-trade system on its own. "We have no plan to do that at the moment. We've chosen to move ahead with regulation and we believe that we're seeing early results," said Kent. The NTREE Report warns, "[d]elay leads to rising carbon emissions each year, and a higher financial and economic cost in ultimately acting to meet our stated GHG emission targets for 2020 or beyond. Neither outcome is desirable or inevitable." "Canada still does not have a national plan to ensure the federal government is ready to respond to major incidents involving spills from vessels transporting all kinds of hazardous and noxious substances. The Canadian Coast Guard has unclear, incomplete, and unreliable data about oil spill responses, and cannot accurately determine the actual size of spills, how many spills required onsite responses, how many spills required the use of Canadian Coast Guard equipment, and the results of the cleanup efforts," says the Commissioner Vaughn's report. "Environment Canada has been running the federal water quantity and water quality monitoring programs for about 40 years without knowing who - if anyone - is monitoring the quality of fresh water on federal lands," the report highlights, noting Environment Canada has water quality monitoring stations on only 12 of some 3,000 First Nation reserves. In a case study related to Canada's oil sands, the Commissioner's report notes studies have long suggested that oil sands mining has environmental impacts as a result of freshwater use and pollutant releases. Although the first commercial oil sands production began in 1967, Environment Canada had only recently identified the oil sands region as a priority ecosystem and hotspot for further assessment and intervention. Little or no water quality monitoring has been undertaken to date, so there is "no baseline measures or long-term data to track changes in water quality and aquatic ecosystem health in the river associated with oil sands development," said the report. The report recommends Environment Canada take the lead in a coordinating a government-wide response to climate change. This would include the sharing of tools and best practices "to improve how the government integrates climate-risk identification, assessment and adaptation into its decision making and planning." "The concerns we have raised in this report are hardly new. About 20 years ago, the federal government acknowledged that the impacts of climate change would pose significant, long-term challenges throughout Canada... Also 20 years ago, the federal government recognized the need for a national strategy to respond to the risks of spills from vessels transporting all kinds of hazardous and noxious substances... There is little in our findings to offset a discouraging picture... In short, the two fundamental problems we identified are a lack of effective and sustained leadership, especially when responsibilities are shared, and inadequate information," wrote Vaughan. Documents obtained through freedom of information requests by the Pembina Institute, Natural Resources Defense Council, and Climate Action Network Canada reveal that Government of Canada officials are systematically trying to kill clean energy and climate change policies in other countries while promoting the interests of oil companies. 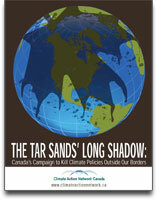 The findings are contained in a new report, The Tar Sands' Long Shadow, released by Climate Action Network Canada, a network of over 75 of Canada's leading non-governmental organizations. The correspondence shows Washington based Canadian diplomats describing recommendations from Environment Canada to clean up the oilsands as "simply nutty," proposing instead to "kill any interpretation" of U.S. energy legislation that would apply to Canadian oilsands "to ensure that the oil keeps a-flowing." The correspondence also shows that Canadian diplomats had contacted officials from the American Petroleum Institute as well as Exxon-Mobil Corp., BP, Chevron Corp., ConocoPhillips, Encana Corp., and Marathon Oil Corp. "to point out the potential implication to their imports from Canada." "We have proof that the Harper government is aggressively intervening in Europe and the United States to kill clean energy policies in the name of promoting the tar sands. Canada is not just exporting dirty oil anymore - we're also exporting dirty policies." said Graham Saul of Climate Action Network Canada. "A responsible government would see clean energy policies outside our borders as an opportunity to do better, not as a threat," said Clare Demerse, the Pembina Institute's Associate Director of Climate Change. "We are calling on the governments of Canada and Alberta to stop all efforts to kill clean energy and climate policy in other countries," said Steven Guilbeault of Équiterre. Two recent reports outline the subsidies provided by Canada's federal and provincial governments towards fossil fuel production. Fossil Fuels - At What Cost? released by International Institute for Sustainable Development (IISD) uses an internationally agreed definition of subsidy adopted by the World Trade Organization to determine that Canadian federal and provincial governments provided $2.84 billion to support oil production in 2008. The federal government's share of subsidies in 2008 was $1.38 billion. Alberta was estimated at $1.05 billion, Saskatchewan at $327 million. A total of 63 subsidy programs were identified, and the study forecasts a doubling of subsidy amounts by 2020 if government policies stay the same. Climate Action Network Canada released, Fuelling the Problem, November 4, 2010. The report describes problems with tax breaks for the fossil fuel industry, outlines global initiatives to eradicate fossil fuel subsidies, and urges the Canadian federal government to eliminate fossil fuel subsidies in the upcoming 2011 budget. "As the world moves towards a clean energy economy, ongoing tax breaks and subsidies to the fossil fuel sector are taking Canada in the wrong direction," declared Steven Guilbeault of Equiterre. "The reality is this government isn't fighting climate change, it is fuelling the problem and the 2011 budget is an opportunity to move the country in the right direction," added Graham Saul of Climate Action Network Canada. 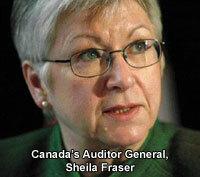 The call for concrete information about the costs of health care, including in the face of climate change impacts, came from Sheila Fraser, Auditor General of Canada. "Will governments have the cash to meet the health needs of our aging population without increasing debt to unsustainable levels? ", asked Fraser addressing the 143rd annual meeting of the Canadian Medical Association (CMA) in Niagra Falls Ontario, August 2010. "Frankly, I'm not sure the government of Canada has all the information it needs to answer this important question. The federal government looks ahead only about three to five years and it should be looking down the road at least 25 years." explained Fraser as she called on the federal government to do long-term fiscal projections to prepare for the challenges of an aging population, and health impacts of climate change. Delegates to the CMA general council - which is commonly described as the parliament of Canadian medicine - echoed Fraser's concerns, passing resolutions urging the Canadian Government to add sustainability as the sixth principle of the Canada Health Act. Canada's provincial and territorial leaders met in Winnipeg for Council of the Federation (COF) session August 4-6, 2010. Climate Action Network Canada (CAN-RAC) organizers were in Winnipeg and in collaboration with the David Suzuki Foundation released a brief outlining: the top five provincial actions and commitments, the five most misguided provincial actions, and the top five priorities to tackle climate change. "This brief shows that provinces can make significant progress on climate action even in the absence of federal leadership," said David Suzuki Foundation climate change policy analyst Dale Marshall, adding "Premiers need to keep their promise to make climate change a central agenda item at their meetings." The 2007 Council of the Federation Premiers agreed to collectively generate 25,000 MW of additional renewable energy by 2020 and develop a consistent way of measuring greenhouse gas emissions. In 2008 they agreed to increase energy efficiency across the country by 20 per cent by 2020. "We need to know what's happening. How well are they doing in implementing these promises?" said Steven Guilbeault of Equiterre. Climate Action Network Canada (CAN-RAC) is calling on premiers to create a climate-change secretariat to better co-ordinate policies and climate actions among the provinces. 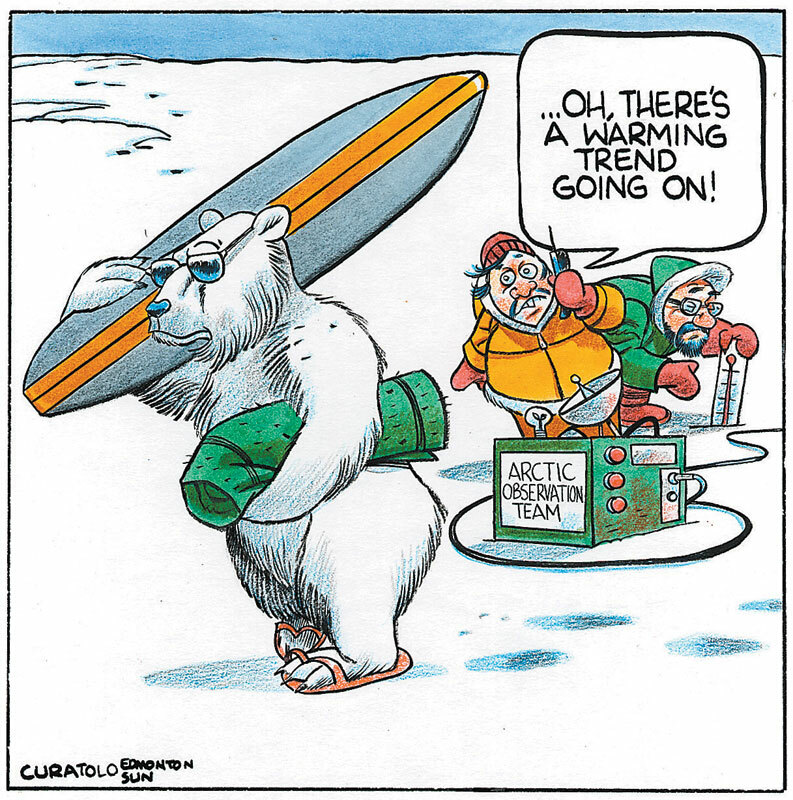 "Despite promising initiatives by various provinces and territories, the lack of progress on the climate change file sends some pretty worrisome signals in terms of provinces and territories' ability to tackle this critically important issue together. 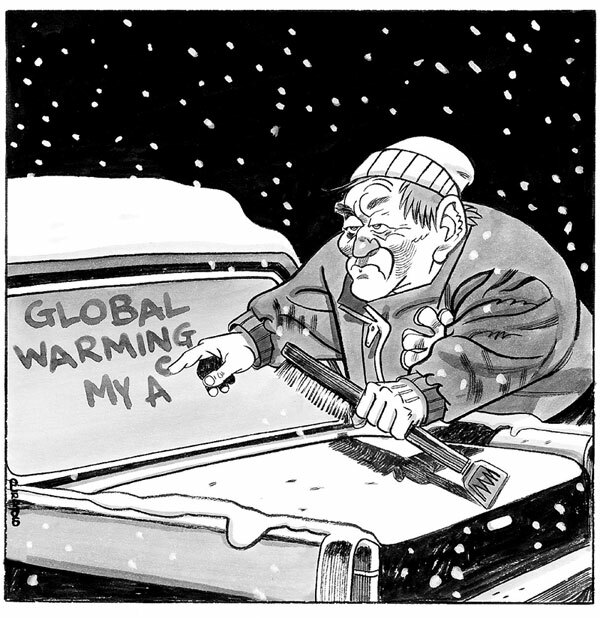 Is the Council of the Federation condemned to replicate Ottawa's inability or unwillingness to act on climate change?" asked Equiterre co-founder Steven Guilbeault at the closing of the meeting.Between 1990 and 2008, Quebec and Alberta both contributed 18% to Canada's GDP growth, yet Quebec's emissions fell while Alberta's emissions rose 52%. Together, Alberta and Saskatchewan make up 74 per cent of the reported increase in Greenhouse Gas (GHG) emissions. Ontario led GDP growth at 40%, but only contributed 10% of the rise in emissions, in the same period. "Each jurisdiction has their own plan to deal with climate change," Manitoba Premier Greg Selinger said at the wrap-up of the conference. "We're comfortable with a diversity of approaches which get results." The National Round Table on the Environment and the Economy (NRTEE) released Measuring Up: Benchmarking Canada's Competitiveness in a Low-Carbon World, as the first in a series of seven reports examining how Canada can prosper through the economic risks and opportunities of climate change. 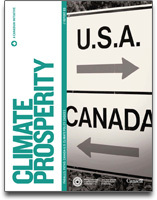 Climate Prosperity report series is a comprehensive, two-year policy research and advisory program being undertaken on economic risks and opportunities to Canada of climate change. These reports will examine what the impacts of a warming climate mean to Canada's environment and what a global low-carbon transition will mean to Canada's economy. Measuring Up outlines Canada's first Low-Carbon Performance Index (LCPI), which can be used to compare Canada carbon performance to other G8 countries. The LCPI examines effects under three categories: emissions and energy; innovation, skills, investment; and policy and institutions. The categories are meant to illustrates Canada's performance while examining our capacity to prosper in a carbon constrained world. The LCPI should be updated regularly to continually track performance and measure progress. Public accountability is essential for elected officials, governments, businesses, experts, and others to assess carbon progress and propose future steps. A nationally scoped, low-carbon index should be developed for Canada. This index should use broader, more comprehensive range of categories and indicators to marshal domestic efforts across all Canadian governments to development a low-carbon economy. The LCPI and suggested national low-carbon index should form the basis for developing a comprehensive low-carbon growth plan for Canada. Such a policy pathway needs to be fully integrated into existing and future economic, environmental, and social policy planning frameworks. Bill C-311, known as The Climate Change Accountability Act, passed third reading in the Canadian House of Commons May 5th, 2010. The following day, May 6 2010, an "Open Letter Supporting the Climate Change Accountability Act" was sent to all Members of the Canadian Senate. The letter was signed by twenty civil society organizations and urges the Senators to promptly pass Bill C-311. Manitoba Wildlands was amongst the signatories, which also include: Climate Action Network Canada, David Suzuki Foundation, Oxfam Canada, Sierra Club of Canada, National Union of Public and General Employees, Nature Canada, and WWF Canada. The Canadian House of Commons Bill C-311, entitled An Act to ensure Canada assumes its responsibilities in preventing dangerous climate change passed second vote April 14, 2020. The Bill requires the Canadian government to set regulations to bring emissions 25% below 1990 levels by 2020, with a long-term target to bring emissions 80% below 1990 levels by 2050. The Bill moves to a third reading and a vote to adopt the Bill May 5th, 2010. The bill previously passed third reading in House of Commons in 2008 but did not have its Senate vote and died because of the election call. "After years of the government backsliding on climate change it is refreshing to see political parties reuniting on this critical issue," said John Bennett, Executive Director of Sierra Club Canada. "The government must now heed the will of the House and the Canadian people, it is time to put this bill into law." "We can't afford to put global warming aside anymore, we need real action to curb climate change in Canada," said Bennett. "This bill should have been passed years ago, now we have to get moving on concrete measures to put this bill into practice." In addition to Bill C-311, the Liberal Official Opposition tabled a motion calling on the government to take immediate and decisive action on the environment and climate change. The motion called on the Conservative government to set legally binding, long term emission reduction targets, and implement a national climate change plan with economy-wide regulations. Before any public knowledge that outgoing NDP Manitoba Premier would soon be Canada's Ambassador to the US Gary Doer changed his 'policy' on climate change. In his speech to the August 2009 national NDP convention in Halifax, Nova Scotia Mr. Doer (who was the first Canadian government leader to endorse the Kyoto Protocol), outlined his new position for the Copenhagen global climate change agreement. While talking about reducing greenhouse gas emissions being "a good thing" Mr. Doer went on to say, "And whether it is the World Trade Organization, the Canada-US trading relationship or the issues of trade in Copenhagen, it will be very important that we do not have a 'Trojan Horse' that eliminates jobs in North America and jobs in Canada in the guise of Climate Change because India and China are not scoped in on an equal basis." The inclusion of China and India 'on an equal basis' in a global climate agreement was an argument traditionally used by the Bush administration - and supported by Canada's current government. This stance has helped to sabotage international negotiations, provoking disagreement amongst nations rather than promoting cooperation. In taking this position, Canada and the US (when led by the Bush-administration) have been choosing to ignore the principles of equity, historical responsibility and the capacity of each country to act that are the basis for the UN Framework Convention on Climate Change and the Kyoto Protocol. In the context of the UN negotiations, this means acknowledging that developing countries and emerging economies are not in the same position including in actual per capita emissions. They cannot be required to take on emissions reductions targets in the same way as developed countries. Moreover, Canada has been advocating for China and India to take on binding emissions cuts despite our own 30% increase since 1990. The National Round Table on the Environment and the Economy released its annual response to Canada's "Climate Action Plan", a requirement under Canada's Kyoto Protocol Implementation Act. NRTEE's response to the Plan concluded that many of the emission reductions attributed to specific measures and policies are overestimated. The NRTEE indicated that it is insufficient to rely on the annual assessment approach in Canada's KPIA due to short-term focus and unclear definition of emissions. The Canadian government has overstated greenhouse gas reductions expected from its climate change plans and Environment Canada, the department responsible, will be unable to determine actual emission reductions for each of the measures planned. The criticisms come from a report tabled in the House of Commons May 12, 2009 by Scott Vaughan, Canada's Commissioner of the Environment and Sustainable Development. It follows the Commissioner's February 2009 release of a December 2008 report that was also critical of the government's climate change measures view section below). Canada's climate change plans are missing other information required by the Kyoto Protocol Implementation Act, including how total national greenhouse gas emission levels compare with Canada's Kyoto target or whether measures under the plan were in place on time. The Pembina Institute, a non-partisan sustainable energy think tank, responded to the Environment Commissioner's report by calling for Canada to signal to the world it is ready to move forward with an ambitious approach to climate change. The Pembina Institute urged Environment Minister Jim Prentice to initiate the legal process required to cap Canadian emissions before the UN climate conference in Copenhagen December 2009. Canada's 2007 Greenhouse Gas (GHG) Emissions Inventory information shows that carbon emissions continue to rise. The ongoing rise is evidence that calls by civil society groups for Canada to step up action on climate change and strengthen its climate change plan and targets are valid. The most significant causes of Canada's emissions growth between 1990 and 2007 were: large increases in oil and gas production; a large increase in number of motor vehicles; and greater reliance on coal-powered electricity generation. On February 10, 2009 Bruce Hyer, NDP MP for Thunder Bay-Superior North, reintroduced the Climate Change Accountability Act (Bill C-311) as a Private Member's Bill. NDP Leader Jack Layton originally introduced the Climate Change Accountability Act as Bill C-377 in October 2006. It passed third and final reading in the House of Commons June 2008 with the support of the Liberal Party of Canada, Bloc Quebecois and NDP. It did not complete Senate consideration before Parliament dissolved for the October 2008 federal election. The Climate Change Accountability Act is based on a report, The Case for Deep Reductions, by the Pembina Institute, David Suzuki Foundation, and National Round Table on the Environment and the Economy. The Act requires the Canadian government to set regulations to attain a medium-term target to bring emissions 25% below 1990 levels by 2020, and a long-term target to bring emissions 80% below 1990 levels by 2050. It creates an obligation on Canada's Commissioner of the Environment and Sustainable Development to review proposed measures to meet the targets and submit a report to Parliament. Over thirty Canadian organizations concerned about climate change are urging federal party leaders to again pass Bill C-311, the Climate Change Accountability Act, before Parliament's summer break begins on June 23, 2009. The February 23, 2009 letter notes the world is more than halfway through a two-year negotiation on the next global climate treaty, set to wrap up in Copenhagen, Denmark December 2009. The letter asserts that the Act "would set national emission targets that represent Canada's fair share of this global effort to prevent dangerous climate change" and signal to the world that Canada will do its part. Further, the letter points to evidence that Canada can reach a science-based emissions target in 2020 while growing its economy and reminds party leaders that the 2050 target of the Act is identical to President Barack Obama's 2050 target for US emissions. Signatories to the letter include national environmental organizations, faith and labour groups, across seven provinces and the North. Canada's Climate Change Accountability Act (Bill C-311) cleared an important hurdle Wednesday April 1, 2009 in the House of Commons. The passing of the Act was largely thanks to a Liberal motion, which changed the timing of the vote, moving it up the agenda, allowing more Parliamentarians to be present for this crucial vote. The Bill will now go to Parliament's environment committee to be discussed and amended, then it will be sent back to the House for 3rd reading. Senate Review is the final step for the Act. 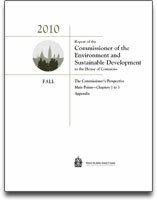 Canada's Commissioner of the Environment and Sustainable Development, Scott Vaughan, tabled his first Report in the House of Commons February 5, 2009. The report states Canada's government cannot demonstrate that certain air emission reductions it has claimed have actually been achieved or will be achieved. The Environment Commissioner's audit looked at examples of four key measures chosen by the federal government to reduce air pollution - regulations, pollution prevention plans, economic measures, and voluntary agreements. For instance, the report found no evidence to support the emission-reduction claims associated with the government's $1.5-billion clean-air and climate-change trust fund and the $365-million public-transit tax credit. 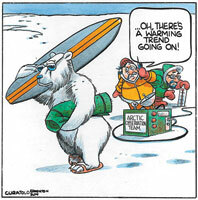 The trust fund was created by the Canadian government in 2007 as part of its Turning the Corner climate change plan. The Pembina Institute, a non-partisan sustainable energy think tank, response to the Environment Commissioner's report offered solutions to ensure the federal government is more accountable regarding its climate change programs and initiatives. "To prevent this from happening again, the government should be required by law to state the expected emission reductions every time programs to cut pollution are announced in the budget. And funding for provincial or municipal initiatives must be accompanied by accountability mechanisms, to ensure both that expected emission reductions occur, and that they are in addition to what would have happened without the funding." 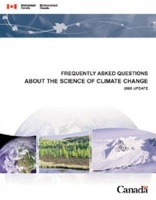 Canadians frequently ask questions that indicate considerable public confusion about many aspects of climate change science. Some of this confusion stems simply from the fact that the climate system is extremely complex. It is a significant challenge for anyone not reading the primary scientific literature on an ongoing basis to know what to consider 'sound science' and what not. This report is based on fundamental, well-accepted principles on the highly acclaimed international science assessment reports of the Intergovernmental Panel on Climate Change (IPCC), and on recent peer-reviewed scientific papers. This 2008 update also includes results from the many new papers and reports published since then, particularly the recently released Fourth Assessment Report of the IPCC, published in 2007. In July 2008, Health Canada quietly released a report assessing research on the health risks posed by climate change. The report is the first comprehensive assessment of health vulnerabilities to climate change in Canada, providing an "up-to-date synthesis of knowledge on how the health of Canadians is affected by our climate today, and what may lie ahead under future climate change." Health Canada has not made the full report publicly available on its website, but a scanned copy of the full report can be found elsewhere on the web. A total of 168 Canadian communities and cities have joined the Federation of Canadian Municipalities' Partners for Climate Protection (PCP) program. The PCP program is a network of Canadian municipal governments committed to reducing greenhouse gases and acting on climate change. PCP is the Canadian component of International Council for Local Environmental Initiative's (ICLEI) Cities for Climate Protection (CCP) network. Vancouver's goal is to reduce GHG emissions to 33 percent below current levels by 2020 and 80 percent below 1990 levels by 2030. The City has Climate Change Action Plans for City operations and community action. Calgary's Plan sets out a corporate target to reduce the City's GHG emissions to 50 percent below the 1990 level by 2012. Regina's Climate Plan sets out GHG reduction by retrofitting facilities, using efficient street lighting, and converting 70 vehicles to natural gas. Winnipeg's Climate Change Action Plan aims to bring civic emissions down to 69,500 tonnes or a 20 percent reduction from 1998 levels by 2012. Yellowknife faces unique challenges with CO2 emissions almost two-times the national average with nearly 80 percent of emissions a result of space heating. 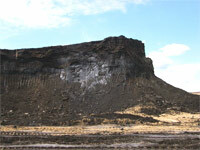 Their Community Energy Plan aims to reduce emissions by 20 percent by 2014. Montreal's Corporate Action Plan sets actions for vehicles, processes, buildings, and sharing of information. Corporate greenhouse gas emissions target is 20 percent by 2012 based on 2002 emissions. Halifax's plan reduces greenhouse gas emissions from municipal operation by 20 percent from 2002 levels by 2012, and focuses on energy reduction in buildings. homes and promoting alternative transportation. On August 1, 2008 The National Round Table on the Environment and the Economy (NRTEE) released its evaluation of the federal government's (Environment Canada) latest greenhouse gas (GHG) reduction plan under the Kyoto Protocol Implementation Act. The NRTEE is obligated to undertake research and advise the Environment Minister on the likelihood the proposed policies and measures will achieve forecasted emissions reductions stated in its GHG reduction plan within 60 days of receiving the government's plan. The NRTEE must also provide advice as to the likelihood that these policies and measures will enable Canada to meet its obligations under the Kyoto Protocol. Similar to 2007, the NRTEE concluded that the federal government is likely overestimating emissions reductions that will occur as a result of almost all plan initiatives during the Kyoto Protocol commitment period (2008-2012). For instance, the NRTEE notes there are problems with accounting for and presentation of emission reductions attributed to the technology fund. Although emission reductions will occur as a result of the technology fund, for the most part these will occur outside the 2007-2012 forecast period. Emission reductions should be accounted for in the year they will likely occur and not in the year the contribution is made to the technology fund. The NRTEE also indicates the federal government has not given enough consideration to issues of free-ridership, rebound effects, and whether stated emissions reductions would have occurred in the absence of the program/initiative (additionally). As a result, it is likely emissions reductions attributable to these measures are overstated. The NRTEE report also suggests there is uncertainty whether or not the Regulatory Framework for Air Emissions will result in significant emissions reductions in the Kyoto timeframe. The NRTEE gave the federal government credit for efforts to improve on its 2007 plan. The NRTEE acknowledged that, overall, the 2008 plan is more transparent and a more accurate representation of projected emission reductions. Other improvements include provision of integrated modeling results and more detail and information on assumptions regarding forecasts and policy measure. The Kyoto Protocol Implementation Act (KPIA), which received Royal Assent June 2007, stipulates that each year the Government of Canada must prepare a Climate Change Plan describing measures and policies it enacted to meet its obligations under the Kyoto Protocol. The government's first plan was released September 20, 2007 (see section below, NRTEE Slams Government's Kyoto Act Plan). The government's second plan was released May 31, 2008. To help the government improve its forecasting methodology and governance, the NRTEE has recently examined how other industrialized countries approach emissions forecasting. The results can be found in its Greenhouse Gas Emissions Forecasting - Learning from International Best Practices report, released along with its 2008 Kyoto Protocol Implementation Act Response. Bill C-377, An Act to ensure Canada assumes its responsibilities in preventing dangerous climate change (otherwise known as the Climate Change Accountability Act) was passed in the House of Commons June 4, 2008, despite opposition by the minority Conservative government. Canadian environmental groups applauded the passage of the legislation, hailing at as "an important step towards deep reductions of greenhouse gas emissions". The Climate Change Accountability Act is a private member's bill tabled by NDP leader Jack Layton. It requires Canada to cut greenhouse gas emissions by 25% from 1990 levels by 2020, and by 80% by 2050. These targets are in line with levels scientists say are needed to avoid dangerous climate change, and the law is based on the findings of the Nobel Prize winning Intergovernmental Panel on Climate Change. Under the Act, the federal government will also be required enact regulations and take other measures to meet these targets. Bill C-377 was the subject of controversy as it went through the House of Commons process to become law. Conservative Members of Parliament filibustered the House of Commons Standing Committee on the Environment and Sustainable Development for over 17 hours as it undertook to review the proposed legislation. June 5, 2008, April 9, 2008, April 7, 2008. Environmental non-government organizations and civil society groups have been urging governments around the world to limit climate change to less then 2 degrees Celsius (2°c) globally. In Canada, a coalition of over 20 Canadian public interest groups launched the Kyotoplus campaign, designed to mobilize public support for an urgent solution to the global warming crisis. The initiative is premised on widely accepted scientific evidence, which demonstrates that to prevent catastrophic climate change impacts, the global average temperature increase above pre-industrial levels must be kept below 2°c. Manitoba Wildlands is a member group of the Kyotoplus campaign. In response to a Freedom of Information request to the Government of Canada for "All documents or analysis prepared concerning a '2 degree Celsius' threshold limit for global warming (Time period: Jan. 1, 2006 - August 28, 2007)", the Government of Canada provided information concerning briefing material prepared on the issue. On March 10, 2008 the Government of Canada published details of Turning the Corner, its regulatory framework for greenhouse gas emissions, originally announced April 26, 2007 as part of Turning the Corner (its 'action plan' to reduce GHG emissions and air pollution). The federal regulation of industry's greenhouse gas emissions is intended to help achieve the Government's commitment to a 20% reduction in Canada's overall emissions (from 2006 levels) by 2020. This announcement reiterated mandatory reductions for industry announced in April 2007, along with additional new measures intended to address two of Canada's key emitting sectors: oil sands and electricity. Proposed greenhouse gas regulations are expected to be published in the Canada Gazette later this year, and regulations finalized in 2009 to come into force on January 1, 2010. Representatives of Climate Action Network Canada-Réseau Action Climat Canada (CAN Canada) based their response to the federal government's March 2008 new details regarding its intensity-based regulatory proposal for heavy industry on new analysis from the Pembina Institute. CAN Canada says significant new loopholes in the federal government's climate change plan will allow greenhouse gas emissions to grow and that it lets the polluting oil sands industry off the hook by delaying emission reductions for a decade. The Sierra Club Canada issued its own response, saying the newly released details of the federal government's regulatory framework represent a missed opportunity for improving the government's inadequate approach to climate change. The regulatory framework employs an intensity-based rather than a cap and trade emissions system that places an absolute limit on emissions. Most large-scale emissions trading systems in the world, including the EU GHG emissions trading system, and the main air pollution trading systems in the US, are cap and trade systems. The updated version of Canada's regulatory framework retains the national target of 20% below 2006 by 2020; a target that falls short of what the science says is needed. Canada was part of the consensus in Bali December 2007 at UN Climate Change Talks, which recognizes that rich nations need to cut their greenhouse gas pollution by 25% - 40% below 1990 levels by 2020. The Federal government's announcement delays emissions reductions from new coal plants and tar sands projects by only requiring those coming into operation in 2012 or after to reduce emissions by 2018 at the earliest. The government's projections show its timeline for targets will allow oil sands companies to nearly triple their emissions by 2017 before dropping once new targets take effect 2018. By exempting facilities that start up before 2012, the federal timeline creates an incentive for companies to bring new oil sands facilities on stream more quickly to "beat the deadline" and avoid the targets. In documents submitted to the UN, the Government of Canada states that "Canada will require new oil sands facilities and coal-fired power generation plants to put in place large-scale carbon capture and storage (CCS) and other green technologies," leaving out that there is no "requirement" that facilities starting up before 2012 are exempt; and that CCS-level targets will only be applied starting in 2018. Manitoba Wildlands has prepared a listing and status report for climate action plans from Canadian provinces and territories. Using Pembina Institute and Council of the Federation summer 2007 tools, we are providing a citizen's listing of online climate plans, and government statements. 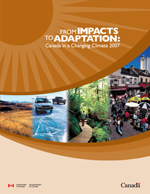 Natural Resources Canada's report From Impacts to Adaptation: Canada in a Changing Climate 2007, a national study that reflects risks and opportunities of climate change for Canada was released by the federal government, after sections were leaked to the media in March, 2008. Canadians had waited since September 2007 for its release. Years of research and input from more than 140 experts across the country, including IPCC contributors, reveals Canada's vulnerability to climate change. "This report is yet another wake up call for a government that has not yet produced a meaningful climate change plan or passed any legislation to protect Canadians from global warming," said Graham Saul, Climate Action Network Canada. The report highlights impacts of greenhouse gas pollution for Canada, region by region and suggests that emission reduction is not enough. Canada must adapt and adjust decisions, activities and thinking to an already changing climate locally and on a national level. Impacts of changing climate are already evident in every region of Canada. Climate change will intensify current climate risks, present new risks and opportunities. Climate change impacts and adaptation measures in other parts of the world will affect Canadian consumers, industries, aid and peacekeeping. Resource-dependent and Aboriginal communities, critical infrastructure, and ecosystems are most vulnerable to climate change, especially in Northern and Arctic Canada. Adaptive capacity in Canada is high, but unevenly distributed between and within regions and populations. Some adaptation is occurring in Canada, for response to and in advance of, climate change impacts. Integrating climate change into planning processes is an effective approach. Across Canada, climate change will greatly affect infrastructure, the quantity and quality of drinking water, and energy industries relying on water - oil, gas, mining, and hydroelectricity.